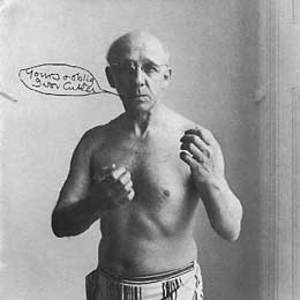 Ivor Cutler (January 15th, 1923 ? March 3rd, 2006) was a Scottish poet, songwriter and humorist. Originally a teacher, he taught at A.S. Neill's Summerhill School. He appeared in The Beatles' Magical Mystery Tour film," on Neil Innes's television programmes, and on john peel's influential BBC radio programme, for which he recorded a total of twenty-one sessions between 1969 and 1991. In live performances he would accompany himself on a harmonium. Many of his poems and songs involve conversations delivered as a monologue and, in these, one party is often Cutler as a child. The humour often develops from the child's curiosity and the playful or self-serving lies the parent tells him to get, for example, a chore done or simply to stop the incessant questions. More of Cutler's poetry is in the form of short, almost epigrammatic, observations and micro-dramas, usually surreal. He could draw impossible pictures of the thoughts and actions of ordinary people, animals, or objects with the same sense of an outsider's wonder. Cutler was born in Glasgow, ?cotland into a middle-class Jewish family of eastern European descent. He cited his childhood as the source of his artistic temperament, recalling a sense of displacement when his younger brother was born: "Without that I would not have been so screwed up as I am, and therefore not as creative." In 1939 Cutler was evacuated to Annan. He joined the Royal Air Force as a navigator in 1942 but was soon dismissed for "dreaminess". He moved to London where he was employed by the Inner London Education Authority to teach music, dance, drama and poetry to 7- to 11-year-olds. Cutler's deeply held views on humanity meant he disliked corporal punishment, and on leaving a teaching job he held in the 1950s, he cut up his tawse (an implement for physical punishment) and handed the pieces to the class. He was married briefly and had two children. Cutler began writing songs and poetry in the late 1950s, making the first of many appearances on BBC radio on the Home Service, where he featured on the Monday Night at Home programme on 38 occasions between 1959 and 1963. He gained popularity playing songs where he would often accompany himself on the harmonium, and this success led to the release of a series a records starting with 1959's Ivor Cutler of Y'Hup EP. Cutler continued to make appearances on the BBC's programmes during the 1960s, and as a result of an appearance on the television show Late Night Line-Up, he was noticed by Paul McCartney, who invited Cutler to appear in The Beatles' Magical Mystery Tour film. In the film, Cutler plays bus conductor Buster Bloodvessel, who becomes passionately attracted to Ringo Starr's Aunt Jessie. Following this film role, Cutler recorded a second LP. Ludo (1967), produced by the Beatles' George Martin, and credited to the Ivor Cutler Trio, made up of Cutler with bassist Gill Lyons and percussionist Trevor Tomkins. The LP, taking inspiration from traditional jazz and boogie-woogie, sees Cutler playing the piano as well as his usual harmonium, and is considered the most traditionally musical of all his records. Ludo did not enjoy great commercial success, and after its release Cutler continued to perform for BBC radio, recording the first of his sessions for John Peel in 1969. Cutler's work on Peel's shows would introduce him to successive generations of fans, and in the early 1990s, Cutler said, "Thanks to Peel, I gained a whole new audience, to the amazement of my older fans, who find themselves among 16-to-35s in theatres, and wonder where they came from." In the 1970s, Neil Ardley had Cutler sing on his A Symphony of Amaranths LP (1971), and former-Soft Machine singer Robert Wyatt asked Cutler to play harmonium and sing on two of the tracks on his Rock Bottom LP (1974). The collaboration with Wyatt led to Cutler being signed to Wyatt's record label Virgin Records, for whom Cutler recorded three LPs in the mid-1970s: Dandruff (1974), Velvet Donkey (1975) and Jammy Smears (1976). (It also led to Wyatt covering Cutler's "Go And Sit Upon The Grass", from Velvet Donkey, as "Grass" on his 1981 Nothing Can Stop Us album.) Each of these discs intersperses Cutler's poems and songs with readings by his performing companion Phyllis King. During the decade Cutler used his sessions for John Peel to introduce numerous episodes of his "Life in a Scotch Sitting Room" series, culminating in the 1978 LP Life In A Scotch Sitting Room Vol II (Volume 1 was a track on the 1974 album Dandruff), regarded as a particularly autobiographical work, on which Cutler recounts tales from his childhood amid an environment of exaggerated Scottishness. Cutler also produced the work as a book, which was published in 1984 with illustrations by Martin Honeysett. Cutler contributed the track "Brooch Boat" to the cult 1980 album Miniatures, produced and edited by Morgan Fisher, which consisted entirely of one-minute-long recordings. In the 1980s, Rough Trade Records released three LPs?Privilege (1983), Prince Ivor (1986) and Gruts (1986). He also released the single "Women Of The World", recorded with Linda Hirst, through the label in 1983. Cutler enjoyed further interest from the Creation record company in the 1990s, best known at the time as Oasis' record label. The label released two new volumes of poems and spoken word work: A Wet Handle (1997) and A Flat Man (1998). Phyllis April King appears on several albums and used to be a part of his concerts. She usually read small phrases but also read a few stories. The two also starred in a BBC Radio series, King Cutler, in which they performed their material jointly and singly. Cutler recited his poems in a gentle burr and this, combined with the absurdity of the subject matter, is a mix that earned him a faithful, if small, following. Cutler died on 3 March 2006, following a stroke the previous week.